The SHRM Annual Conference and Exposition in Chicago is right around the corner. One of the biggest HR conferences of the world, #SHRM18 is set to host over 200 concurrent sessions, over 600 exhibitors, and thousands of attendees. Are you ready to take on SHRM 2018? Bringing together industry leaders to cover the latest trends in Human Resources and Talent Acquisition, SHRM Annual promises another show packed with recruiting tips, HR best practices, and talent management strategies. To make the most out of your trip to SHRM 2018 we’ve highlighted five tips to help maximize your time at the conference. Yes, this is a bit of a no-brainer for any conference, especially if networking comes easily to you. But for those who still think “networking” is a word easier said than done, then we urge you to step out of your comfort zone at SHRM Annual. When you’re at the largest HR gathering of the year, there is no better way to experience it than by making new friends and meeting up with familiar faces. One of the many benefits of attending SHRM Annual is having the opportunity to connect with and learn from other HR professionals from around the globe. With attendees representing businesses of all sizes and industries, this conference is bound to expose you to a variety of viewpoints, strategies, and tactics which may just inspire you to rethink your approach to your current talent goals, or perhaps aim for a different goal altogether. The conference also hosts networking events on Sunday, June 17 and Tuesday, June 19 where you can connect with attendees, speakers, and SHRM staff. Friendly reminder: Don’t forget your business cards. SHRM Annual Conference and Expo brings in over 15,000 HR professionals. Stay connected with it all by following the hashtag #SHRM18 on Twitter. We recommend that you follow the hashtag (meaning you periodically view the live stream of posts that are tagged with #SHRM18) before and during the event. Following the hashtag prior to the event gives you more chances to learn pre-show tips like recommended sessions, local restaurants, and networking sessions. You can also engage with others as they prep for the conference and set up times to connect in person. Following the hashtag during the conference helps you stay up to date with live tweets from other conference goers on trending topics and conversations at SHRM. Make sure to tweet your own tips, snippets, and thoughts on sessions, making your attendance more resourceful. 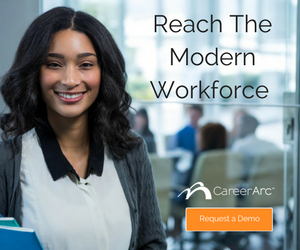 Another friendly reminder: When tweeting, don’t forget to tag us @CareerArc. Choosing from among the 200 sessions can be overwhelming. SHRM’s Find a Session Navigation tool makes selecting a session a lot easier. You can filter by session type or track if you’re interested in a particular topic. Make sure to read the agenda prior to attending the conference so you can outline which sessions fit best for you. Session are on a first come first serve basis so you may want to arrive early to secure a seat. You can also organize your sessions by downloading the SHRM18 App. Over 600 vendors will be exhibiting at SHRM Annual, making the exposition your go-to place for discovering new HR solutions. You can connect with a variety of vendors to learn more about what they offer and if they match your existing or future needs. CareerArc will be exhibiting as well! Stop by booth #1932 to say “hi,” pick up some swag, and enter for a chance to win an Amazon Fire Tablet! You can also schedule a time to speak with us here. First thing on the list: Pizza! Giordano’s is a local favorite serving up its signature, Chicago-style deep-dish pizza, and it’s less than two miles away from the conference. The second attraction requires no admission fee: Discover Chicago’s beautiful architecture at Millennium Park where you can see British artist Anish Kapoor’s Cloud Gate Sculpture, or Spanish artist Jaume Plensa’s Crown Fountain projecting video images from a broad social spectrum of Chicago citizens. Lastly, a way to enjoy summer in Chicago: If you have time, check out the Navy Pier, a 3,300-foot-long pier on the Chicago shoreline of Lake Michigan. You’ll find a 200-foot high ‘Centennial’ Ferris wheel, rides and attractions, including a variety of places to eat and drink. We’d love to meet you! Schedule a time to chat with us during the conference here. Make sure to tweet your tips, pictures, and videos @CareerArc using the hashtag #SHRM18. Make the most out of your trip to SHRM Annual Conference & Exposition. 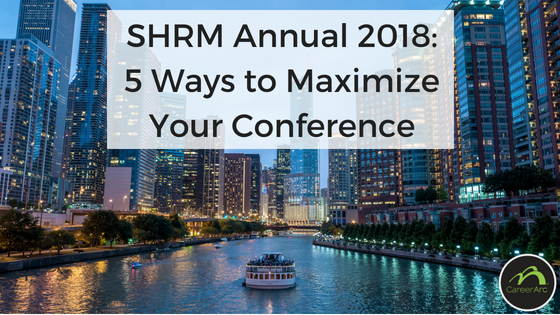 Learn 5 ways to help maximize your time at #SHRM18.